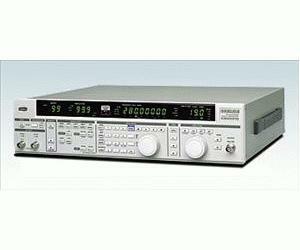 The model KSG4310 is FM/AM stereo signal generator that cover a frequency range of 10 kHz to 280 MHz. Incorporating FM stereo and AM stereo (Motorola C-QUAMTM system) modulators, model KSG4310 is also highly desirable for their compact and labor-saving design. It also incorporates several features and improvements, such as electronic attenuators for improved reliability, a variable AF generator, and a memory scan function, all added while keeping costs at low levels. As a result, the KSG4310 has become the standard in signal generators while at the same time offering superior cost performance.